Plantar fibromatosis is a condition that affects quite a sizeable population across the globe and is seen as cosmetically discomforting. Know what is Plantar fibromatosis and more about this condition including its causes, symptoms, diagnosis, treatment and prevention. It is a condition characterized by formation of hard nodules or bumps beneath the skin surface on the lower region of the foot. The lesions are composed of excess fibrous tissue or collagen in the feet. The condition can affect individuals of any age group. However, it is mostly detected in approximately 25% of the population segment that comprises of middle aged and senior citizens. The disorder is found to be ten times more frequent in men than women. 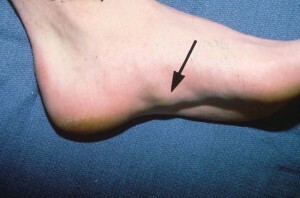 As aforementioned, the disorder gives rise to firm lumps under the skin of lower foot area, particularly the arch. These are hard to touch. People with these nodules may or may not experience any painful symptoms. Pain, if experienced, is largely caused due to pressure exerted on the lump by a shoe. Shoes that push against the arch press the bump and give rise to pain. Patients may also experience pain during standing or walking barefoot. In the initial stages, the lump appears to be small in shape yet noticeable. It appears firm to the touch. Over time, the bump may grow in size. In some patients, there may be a development of multiple painful fibromas. Symptoms usually vary depending on the type of the lesion that a patient suffers from. Patients suffering from certain diseases, such as Diabetes mellitus, Epilepsy, Palmar fibromatosis, Peyronie’s disease, Liver disease and Thyroid problems, are found to suffer more from this condition. Individuals who suffer from recent foot injuries (trauma) or those who overuse their feet for long duration are also at risk from this syndrome. People who consume alcohol for a long period of time are also found to be susceptible to this disorder. Alcoholism is supposed to be a causative as well as aggravating agent for several foot problems. Long-time smokers are also seen to be at higher risk of getting this discomforting disease than non-smokers. Individuals with a family history of this disorder are often found to suffer from this disorder. Hence, genetic factors are supposed to be responsible for the rise of this syndrome. Medications such as beta blockers, which are used for controlling high blood pressure, have been associated with fibrotic tissue disorders. Supplements like Chondroitin/Glucosamine and anti-seizure medications such as Phenytoin can also cause this disease. For patients of foot disorders, it is essential to consult doctors before taking any new supplements or medications. Consumption of high amounts of supplemental vitamin C can promote the manufacture of excessive collagen in the body. This can be directly responsible for Plantar fibromatosis development. The development of this condition is also believed to depend on the ancestry of sufferers. People of North-European origin and Caucasian males over 70 years of age are found to be at a higher risk of getting this condition than individuals who belong to other ethnic groups. According to some experts, the syndrome may also be associated to prior trauma (injuries) of the plantar fascia. Fibromas often occur after an injured fascia repairs itself after an episode of trauma. However, this cause is only speculated by podiatrists and there is no conclusive evidence to prove it as yet. In some cases, the lesions arising from the disease are misdiagnosed for other conditions like post-traumatic neuroma. This can be avoided by a biopsy of the lesion. Samples of the nodules are taken and examined in laboratories under a microscope. This lessens the chance of misdiagnosis. Treatment for this disorder depends on the stage of the condition and whether there are any painful symptoms. Minimal treatment is required during the initial stages, or when the lesions are small in size. Small-sized bumps can be successfully cured with non-invasive treatment. Initial stages of the condition can be cured by preventing direct pressure over the fibromas. This can be done by using padding or operable foot orthotics like heel lifts, soft arch supports or night splints. Decreasing pressure over the fibromas can help reduce them. Topical medications, such as Verapamil, are considered to be effective in decreasing the mass. Verapamil is a calcium channel blocker that is primarily used to treat problems like high blood pressure, irregular heartbeat and angina. Directly applying this drug over the mass for two times every day for several months can help cure the lesions. Cortisone injections can be quite helpful in curing the bumps. However, they can sometimes lead to the enlargement and dispersion of the growths. If the lumps cause pain and fail to improve with non-invasive treatments, it can be removed by an operative procedure. Surgical intervention for this syndrome differs on the basis of the size of the growth and medical history of the patient apart from a few other factors. Operation is performed in a hospital or a surgery center under the effects of general or local anesthesia and takes about 30–45 minutes to be completed. Patients must refrain from lifting heavy loads for at least three weeks after operation. However, the abnormal lumps might recur even after a surgical removal. There is also a possibility that patients might suffer from hammertoe and flat feet problems after operation. Unlike Plantar fasciitis, which being a self-limiting disorder goes away in about 3-4 months, Plantar fibromatosis rarely resolves without some sort of treatment. Fortunately, proper treatment helps resolve unusual lesions in most cases. The condition does not always give rise to serious complications. For many patients, the presence of these lesions does not give rise to any problem. The bumps may remain same in size for a long time or may grow rapidly within a short duration. These are not cancerous growths and hence, do not spread to other areas of the body. As aforesaid however, patients with these nodules may experience painful symptoms at times. You should also examine your feet from time to time to notice any changes that might not be apparent to the eyes. Check out the pictures of Plantar fibromatosis to know more about the condition. If you find any hard lumps arising on your feet, it is best to call up your healthcare provider and make an appointment. Even if Plantar fibromatosis is not a discomforting syndrome, it may be an altogether different condition that you are suffering from. Early diagnosis and cure will help you make a quicker recovery and avoid any complicated condition.